It attracts the brightest innovators and the most forward-thinking companies in the world, and is estimated to be worth more than $300 billion a year. It's the global commercial space industry – and investors can cash in by investing in today's top space stocks. Commercial space's growth started taking off in the 1990s, when budget cuts forced NASA to rely more heavily on private companies. Outsourcing has a few advantages over handling the country's space initiatives in-house that cumulatively make it a faster and cheaper option. First, individual businesses are able to specialize, where NASA was being forced to handle all space-related endeavors. That means NASA has been able to focus on its true purpose – exploration – and leave the fabrication tech to the experts. Second, the private sector isn't weighed down by bureaucratic red tape. And third, a handful of the world's billionaires have been making considerable investments in the sector, supplementing NASA's pool of funds. Now, satellite navigation systems, satellite defenses, satellite television and communications, astronaut transport, and space tourism are driven by private aerospace and defense companies. That's proven to be a boon for their bottom lines. In 2010, U.S. aerospace and defense companies alone generated $324 billion in sales revenue, according to a Deloitte study. In 2002, Tesla Motors Inc. (Nasdaq: TSLA) Chief Executive Officer Elon Musk founded SpaceX, a space transport company that's focused on reducing launch and transportation costs, and enabling the colonization of Mars. In late May, Musk wowed a crowd of employees, aerospace industry experts, and journalists with the rollout of SpaceX's newest manned space capsule: the Dragon V2. The 15-foot tall, "fire-breathing" Dragon V2 is capable of ferrying up to seven passengers and four tons of cargo to and from the orbital International Space Station (ISS). 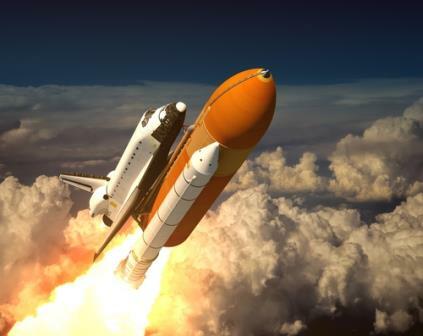 It can travel up to 10 missions before it requires refurbishing – a key to cost-efficient space travel. Musk says his company will transport astronauts to the ISS for roughly $20 million per round-trip seat. That's more than $50 million in savings per seat compared to what NASA presently pays Russia to taxi astronauts to and from the ISS on Russia's Soyuz vehicles. The Dragon V2 is set to make its first flight sometime in late 2015. In 2000, Amazon.com Inc. (Nasdaq: AMZN) Founder and CEO Jeff Bezos set up Blue Origin LLC to do two things: decrease the cost of access to space, and increase the safety of spaceflight. In 2009, Blue Origin was awarded $3.7 million in NASA funding to develop concepts and tech to support spaceflight operations. NASA was happy with the results – in 2011, the agency committed to another $22 million. As of mid-2014, Bezos had invested over $500 million of his own funds into Blue Origin. The company is developing a vertical takeoff and landing rocket ship, and revolutionary rocket engines. Investors can't get a piece of Blue Origin or SpaceX because neither company is publicly traded. And AMZN and TSLA won't derive direct benefit from their leaders' alternative interests. Neither of these companies have public stock, so this article is beyond useless. Anyone betting against Besos and Musk are either nuts or a genius. Only time will tell.